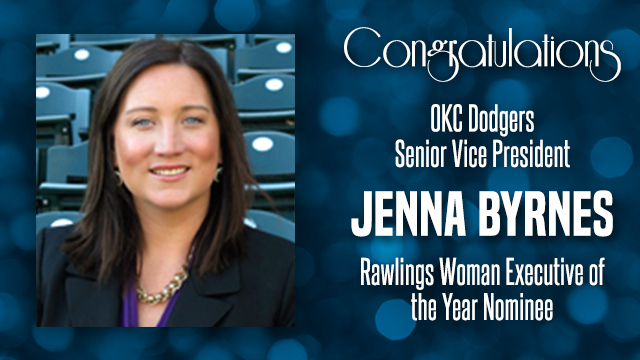 OKLAHOMA CITY - Oklahoma City Dodgers Senior Vice President Jenna Byrnes has been nominated by the Pacific Coast League for the 2015 Rawlings Woman Executive of the Year. It is the second time in three years she has been the league's nominee for the prestigious award. The Rawlings Woman Executive of the Year Award has been presented annually since 1976 to a "woman who has made outstanding contributions to her club, her league, or to baseball." Byrnes is one of 16 nominees, one from each of the minor leagues. The winner will be announced later this fall, and the award will be formally presented during the Baseball Winter Meetings Award Luncheon in Nashville on December 7. In her current position, Byrnes oversees all ticket sales for the OKC Dodgers and manages a sales team of 25 people. She came to Oklahoma City in the fall of the 2010 as the team's Vice President of Ticketing. Prior to her move to Oklahoma City, Byrnes was the Senior Director of Ticket Sales for the Double-A Frisco RoughRiders. "I would like to thank the Pacific Coast League for again nominating me for this tremendous honor," Byrnes said. "The progress that our franchise has made over the past five seasons has been remarkable. Our efforts for a successful 2016 are well underway and we expect a great outcome." The Dodgers had a banner year at Chickasaw Bricktown Ballpark. Throughout the 2015 regular season, 471,996 fans cheered on the Dodgers, marking the team's highest attendance since 2007. Of the 68 home openings, 23 were sold out. The Dodgers hold the distinction of being the only franchise in the 16-team Pacific Coast League that has seen an increase in attendance in each of the past five seasons, as well as just one of two teams among the 30 in Triple-A Baseball to accomplish that feat. "We are very proud of Jenna for being recognized for this award for the second time," said OKC Dodgers President/General Manager Michael Byrnes. "Under Jenna's leadership, our ticket sales efforts have produced phenomenal results and we have engaged more people throughout the state with our brand. Jenna has done this while also being a key member of our management team and an outstanding mentor to our entire staff." The Dodgers are currently accepting ticket package renewals as well as new full-season, half-season, and partial-season ticket packages. For additional ticket information, call (405) 218-1000 or visit okcdodgers.com.